Ashleigh Barty made her country very proud at the Australian Open Sunday afternoon. With the majority of Australia in the stands with the Prime Minister in attendance, the 15th seed stayed in control to defeat Maria Sharapova 4-6, 6-1, 6-4 on Rod Laver Arena at Melbourne Park. It was the first quarterfinal major for the 22-year-old which came with an amazing finish on the court. The two met last year in Rome where the Russian who had won the tournament previously was strong enough to overcome losing the second set and take it in three. 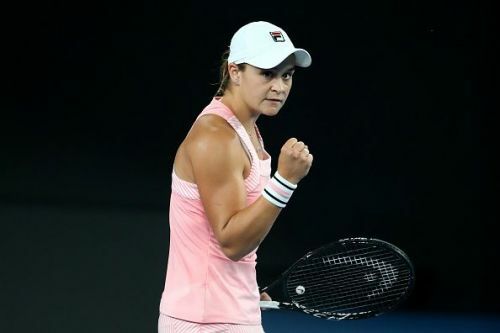 The situation was slightly different coming into the round of 16 with Barty very much a factor to be Australia’s hope to be the first in the open era to win the title. She had yet to drop a set taking down Maria Sakkari who like the Aussie was a strong contender. Sharapova was a target for the 22-year-old who looked to bring the heat and her strong right forehand to keep the journey going. She dictated her opening game forcing Sharapova to run all over the court getting the time to score the winners. The Russian took a different approach firing off wide shots across court creating unforced errors for the easy hold. With the warmup taken care of, Barty started the third with a tactic strategy to answer Sharapova with great returns and an influx of winners. She continued to be the one staying ahead of the 30th seed after five maintaining a consistent charge of the offense. After her hold in the sixth, Sharapova vied for a break on Barty’s serve but watched the Australian force deuce and save the game to remain on serve. The Aussie took her chance for the same result in the eighth but despite playing three break and nine minutes, the game was held by the 31-year-old. With the threat out of the way, she went after the break again and succeeded despite being forced to deuce by Barty. With the small lead and the serve in hand, the Russian dominated gaining three set points to complete 49 minutes. The second serve was running well for Sharapova winning 75 percent while maintaining a well-rounded first. Both struggled against one another on returns making it the true difference maker going into the second stanza. The Aussie started things with a solid hold to prevent a rollover from the first. It set up a short run of service holds that lasted three games when she earned her first break of the match. Sharapova got behind on two errors including the last that went into the net. She consolidated the third with a great hold in the fourth that livened up the home crowd. The 30th seed’s game had turned off enough to give Barty a three-game margin highly threatening a third set to be played. She made it 5-1 for the Australian committing her fifth double fault in the process of being shut out by her own doing. The Russian was on the ropes in the seventh with Barty gaining two set points to get it on a great winner that completed 32 minutes. Sharapova’s offense nearly disappeared serving 50 percent from the first and 25 from the second. It allowed Barty to have a destructive second serve winning 9 of 11 giving her so much confidence into the decider. Sharapova took time off the court to recover her self control and come out to a very critical time in the match. It wasn’t going her way committing a sixth double fault that pleased the Australian crowd. A seventh made it three break points for Barty who took it easy to continue being on the right side of the ball. She looked comfortable on serve taking a 2-0 lead against the 30th seed who failed to show any strength. On serve in the third, the 31-year-old got a slight break due to unforced errors from the 22 but the double faults reared its ugly head for her. She notched her eighth and ninth to force deuce which Barty won on two long balls from the Russian. It was 4-0 for the 15th seed who was on the brink of a major upset and a new place for her career. The Russian aware of her current status played out the fifth where she came back to force deuce where after three breaks and an ace, the 31-year-old ended the shutout with a lone win. A second win arrived for Sharapova with Barty loosening up just enough to have her lead cut in half. The 22-year-old reeled herself in during the seventh getting on the ball each time it came back to earn herself a breakpoint. A long ball put the two players on deuce giving Sharapova life once again. After a 21 shot rally that was such a dramatic finish for Sharapova ended with her winning on a crosscourt that landed on the edge giving Barty no time to return it. One game separated the two with Barty getting behind on her service game. She gained some help with errors from Sharapova that allowed her to score an ace before getting the win on Sharapova’s 49th error of the match. She felt the pressure heavily in the ninth where she served to stay alive keeping ahead on the score to get back within a game. The chance was still with Barty who gained a shot to serve for the match in the tenth. She glided to 30-0 with errors from the Russian until a crosscourt got her into the game. It was too little too late as Barty had two match points with the last one vanishing on a double fault. First woman in #AusOpen quarterfinal in 10 years. An ace came for the Australian for a third match point but they went to deuce for a second time. A returned error into the net was the last one Sharapova made as the 15th seed on a fourth match point came with an ace to complete the upset in 2 hours and 22 minutes. “I gave myself the opportunity in the third set in a lot of games so I had to take a deep breath and trust the work that I’ve done with my team,” Barty said during her on-court interview.